Decorative Life: Can last 2-4 weeks and in rare cases even months, depending on environment, the latter as a foliage plant since most if not all flowers would no longer be present. Growing plants using 150 ppm nitrogen produced longer lasting plants after harvest than those grown using 200-300 ppm. Unrooted cuttings treated with MCP exhibit less leaf yellowing during storage and/or transport but also do not root as well when planted. Over fertilizing ‘Snow Queen’ reportedly may induce this variegated cultivar to revert back to its green leaf form. Storage at 50-60F for 3 days is feasible whereas longer storage periods and/or warmer of colder storage temperatures are generally detrimental. The use of red light emitting diodes during storage can greatly reduce flower bud fall without adding significant heat from this type of light source compared to normal fluorescent and incandesent lamps. Plants of commerce are likely hybrids. Some favorite cultivars and their respective flower colors include ‘Candy Wind’ (pink), ‘Carolina Breeze’ (orange), ‘Golden Wind’ (yellow), ‘Brilliant Red’ (red), ‘Pink Versicolor’ (pink) and ‘Sundance’ (yellow). 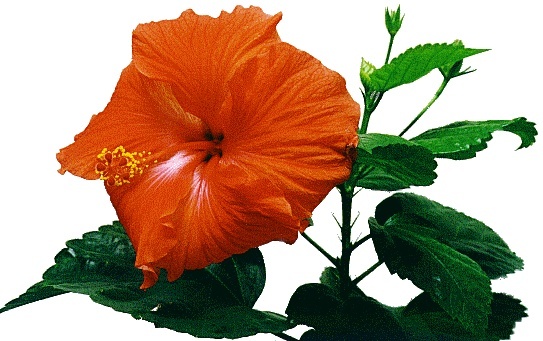 Hibiscus is the Greek name for mallow. Requires high light levels (>200 ft-c.) under interior conditions. Individual flowers do not last long but many new flowers should continually develop if the plant is placed in a reasonable environment. In this case, high light levels are required. Using ‘Nairobi’, van Meeteren and Gelder (2000) showed that flower and flower bud abscission could be prevented or delayed by removing leaves. While leaf removal is not recommended as a cure for flower fall, it does suggest that leaves influence flower fall. Using ‘Pink Versicolor’, Al-Saqri et al. (2002) showed that younger flower buds (stages 1&2) are more susceptible to dark storage which promotes abscission whereas flower buds in these same growth stages are least sensitive to ethylene.